Create endless eye looks with this simply sublime palette, which features beautifully buttery, blendable matte, satin and metallic shades. Each colour combination features five complementary shades of finely milled, ultra-smooth powder so you can effortlessly enhance eyes with depth and dimension. From champagne gold to plum mauve, there’s a shade range to suit every aesthetic – sleek, chic and high-performing, this is everything we love about Hourglass’ game-changing range. 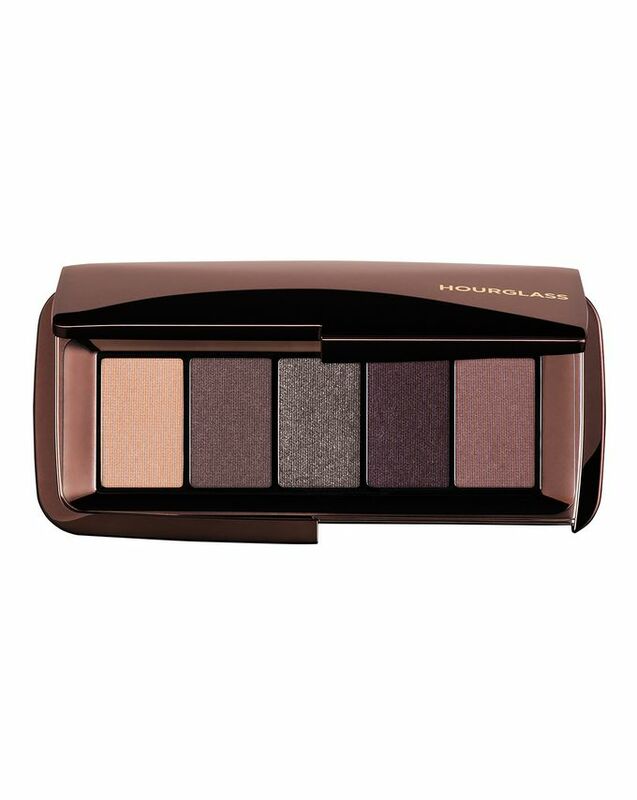 Velvety smooth and super saturated, Hourglass’ Graphik Eyeshadow Palette is a sleek, sophisticated addition to any make up collection. The palette features five complementary shades of finely milled, ultra-smooth shadow, allowing you to endlessly enhance your eyes with depth and dimension. Formulated with a high concentration of pure pigment, the powders grant impressive colour payoff, without sacrificing ease of application or blending. The four line-ups star matte, satin and metallic finishes and a swathe of shades: ‘Vista’ features champagne gold, deep olive, rich brown, bronze and black; ‘Ravine’ features champagne beige, neutral brown, plum brown, warm gold and dark cocoa; ‘Myth’ features warm beige, dusty rose, neutral peach, soft brown and charcoal brown; and, finally, ‘Expose’ features ivory, plum taupe, silver gunmetal, black violet and plum mauve. Ingredients: Mica, Talc, Caprylic/Capric Triglyceride, Ptfe, Zinc Stearate, Stearyl Dimethicone, Ethylene/Acrylic Acid Copolymer, Octadecene, Phenoxyethanol, Poloxamer 338, Silica, Sodium Dehydroacetate, Sorbic Acid, Tin Oxide. May Contain (+/-): Bismuth Oxychloride (Ci 77163), Iron Oxides (Ci 77491, Ci 77492, Ci 77499), Manganese Violet (Ci 77742), Titanium Dioxide (Ci 77891). Ingredients: Mica, Talc, Caprylic/Capric Triglyceride, Zinc Stearate, Ptfe, Stearyl Dimethicone, Aluminum Dimyristate, Disodium Stearoyl Glutamate, Ethylene/Acrylic Acid Copolymer, Octadecene, Phenoxyethanol, Poloxamer 338, Silica, Sodium Dehydroacetate, Sorbic Acid, Tin Oxide, Triethoxycaprylylsilane. May Contain (+/-): Iron Oxides (Ci 77491, Ci 77499), Manganese Violet (Ci 77742), Titanium Dioxide (Ci 77891). Ingredients: Mica, Talc, Caprylic/Capric Triglyceride, Ptfe, Zinc Stearate, Stearyl Dimethicone, Ethylene/Acrylic Acid Copolymer, Octadecene, Phenoxyethanol, Poloxamer 338, Polyethylene Terephthalate, Polyurethane-33, Silica, Sodium Dehydroacetate, Sorbic Acid, Synthetic Fluorphlogopite. May Contain (+/-): Aluminum Powder (Ci 77000), Iron Oxides (Ci 77491, Ci 77499), Titanium Dioxide (Ci 77891). Ingredients: Mica, Caprylic/Capric Triglyceride, Talc, Ptfe, Zinc Stearate, Stearyl Dimethicone, Ethylene/Acrylic Acid Copolymer, Octadecene, Phenoxyethanol, Poloxamer 338, Silica, Sodium Dehydroacetate, Sorbic Acid. May Contain (+/-): Iron Oxides (Ci 77491, Ci 77492, Ci 77499), Ferric Ferrocyanide (Ci 77510), Titanium Dioxide (Ci 77891). Ingredients: Talc, Mica, Caprylic/Capric Triglyceride, Ptfe, Zinc Stearate, Stearyl Dimethicone, Ethylene/Acrylic Acid Copolymer, Octadecene, Phenoxyethanol, Poloxamer 338, Silica, Sodium Dehydroacetate, Sorbic Acid. May Contain (+/-): Carmine (Ci 75470), Bismuth Oxychloride (Ci 77163), Iron Oxides (Ci 77491, Ci 77492, Ci 77499), Titanium Dioxide (Ci 77891). Ingredients: Talc, Mica, Ethylene/Acrylic Acid Copolymer, Caprylic/Capric Triglyceride, Ptfe, Zinc Stearate, Phenoxyethanol, Poloxamer 338, Silica, Sodium Dehydroacetate, Sorbic Acid. May Contain (+/-): Bismuth Oxychloride (Ci 77163), Iron Oxides (Ci 77491, Ci 77492, Ci 77499), Manganese Violet (Ci 77742), Titanium Dioxide (Ci 77891). Ingredients: Mica, Caprylic/Capric Triglyceride, Talc, Ptfe, Zinc Stearate, Stearyl Dimethicone, Octadecene, Phenoxyethanol, Sodium Dehydroacetate, Sorbic Acid. May Contain (+/-): Carmine (Ci 75470), Bismuth Oxychloride (Ci 77163), Iron Oxides (Ci 77491, Ci 77492, Ci 77499), Ferric Ferrocyanide (Ci 77510), Manganese Violet (Ci 77742), Titanium Dioxide (Ci 77891). Ingredients: Talc, Mica, Caprylic/Capric Triglyceride, Ptfe, Zinc Stearate, Stearyl Dimethicone, Ethylene/Acrylic Acid Copolymer, Octadecene, Phenoxyethanol, Poloxamer 338, Silica, Sodium Dehydroacetate, Sorbic Acid, Stearic Acid. May Contain (+/-): Carmine (Ci 75470), Aluminum Powder (Ci 77000), Copper Powder (Ci 77400), Iron Oxides (Ci 77491, Ci 77499), Titanium Dioxide (Ci 77891). Ingredients: Mica, Ethylene/Acrylic Acid Copolymer, Talc, Caprylic/Capric Triglyceride, Ptfe, Zinc Stearate, Phenoxyethanol, Poloxamer 338, Silica, Sodium Dehydroacetate, Sorbic Acid. May Contain (+/-): Carmine (Ci 75470), Ultramarines (Ci 77007), Bismuth Oxychloride (Ci 77163), Iron Oxides (Ci 77491, Ci 77492, Ci 77499), Manganese Violet (Ci 77742). Ingredients: Talc, Ethylene/Acrylic Acid Copolymer, Caprylic/Capric Triglyceride, Ptfe, Zinc Stearate, Phenoxyethanol, Poloxamer 338, Silica, Sodium Dehydroacetate, Sorbic Acid. May Contain (+/-): Carmine (Ci 75470), Ultramarines (Ci 77007), Bismuth Oxychloride (Ci 77163), Iron Oxides (Ci 77491, Ci 77492, Ci 77499), Manganese Violet (Ci 77742), Titanium Dioxide (Ci 77891). Ingredients: Mica, Caprylic/Capric Triglyceride, Talc, Zinc Stearate, Ptfe, Stearyl Dimethicone, Ethylene/Acrylic Acid Copolymer, Octadecene, Phenoxyethanol, Poloxamer 338, Silica, Sodium Dehydroacetate, Sorbic Acid. May Contain (+/-): Bismuth Oxychloride (Ci 77163), Iron Oxides (Ci 77491, Ci 77499), Titanium Dioxide (Ci 77891). Ingredients: Mica, Talc, Caprylic/Capric Triglyceride, Ptfe, Zinc Stearate, Stearyl Dimethicone, Ethylene/Acrylic Acid Copolymer, Octadecene, Phenoxyethanol, Poloxamer 338, Silica, Sodium Dehydroacetate, Sorbic Acid. May Contain (+/-): Iron Oxides (Ci 77491, Ci 77492, Ci 77499), Titanium Dioxide (Ci 77891). Ingredients: Talc, Mica, Caprylic/Capric Triglyceride, Ptfe, Zinc Stearate, Ethylene/Acrylic Acid Copolymer, Phenoxyethanol, Poloxamer 338, Silica, Sodium Dehydroacetate, Sorbic Acid. May Contain (+/-): Carmine (Ci 75470), Bismuth Oxychloride (Ci 77163), Iron Oxides (Ci 77491, Ci 77492, Ci 77499), Manganese Violet (Ci 77742). I love Hourglass products and this one didn't fail to excite. It's slightly darker than the other palette I have, Myth, so more of an evening look can be attained with this palette. 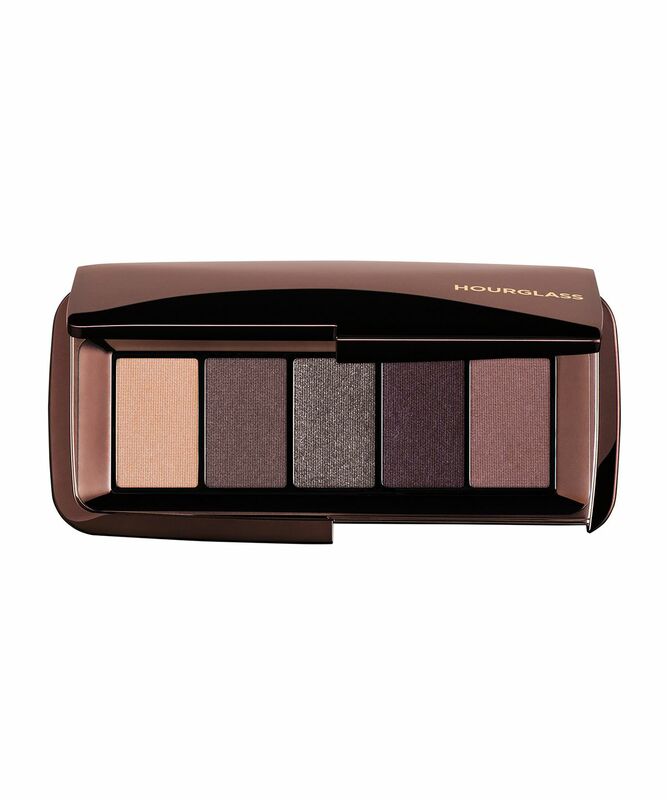 Hourglass products work so well, blend seamlessly and make eye-shadow application a breeze. Perfect shadows, pigmented and perfectly extinguished. I bought the Myth (all mattes) after watching the review video by Mel Thompson. I love doing my makeup in a very natural way and this does give me the effect I like. While it's soft and pigmented, having no fall-outs, the colour scheme of the palette matches well altogether and a natural eye-look is easily created. I bought this palette but I am so disappointed. It is so expensive but is a little palette with no pigment at all. It does nothing for me and I have a medium complexion. I am a fan of Hourglass but this is so bad.